Sophos offer the latest next-gen firewall protection you need plus features you can’t get anywhere else – including mobile, web, endpoint email encryption and DLP. No extra hardware. No extra cost. Simply choose what you want to deploy. 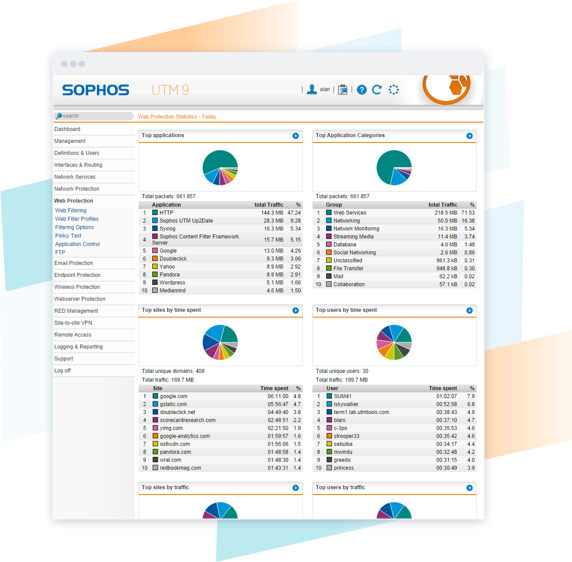 Sophos SG UTM built-in reporting means you’ll know exactly what’s happening with your users. Fix problems fast and shape your policies, keeping your users secure while boosting network performance. And, you get detailed reports as standard, stored locally with no separate tools required. sohpos SG Series hardware appliances are purpose-built devices with the latest technology to provide the ultimate in performance.